B612 Asteroid Institute Strategic Advisor Dr. Brian May has co-authored a 3-D book on the moon race set to be released in November. 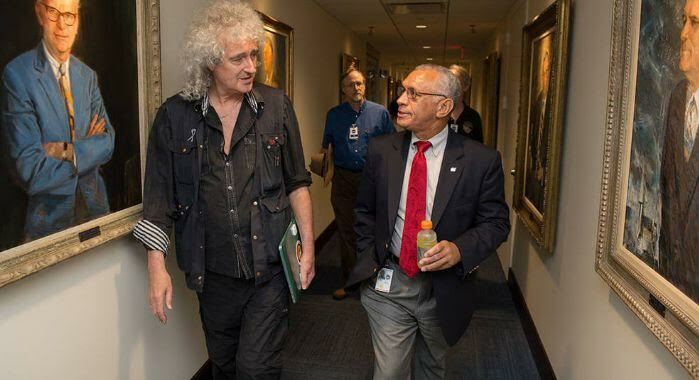 Brian is not only an astrophysicist and guitarist for the rock band Queen, but he also co-founded Asteroid Day in 2014, alongside Apollo 9 Astronaut Rusty Schweickart, B612 President Danica Remy and filmmaker Grig Richters. He also recently spent time with B612 Advisor Marc Buie (pictured above behind Dr. May) during the Pluto flyby. Two years ago, Marc helped get asteroid 17473 Freddiemercury named in honor of what would have been the Queen singer’s 70th birthday.